Minow (Minow Is Not WordPress) Engine can now read data from data-store. It’s not generic enough though – right now hard-coded to Google App Engine, but nevertheless. Basic logic to retrieve content for a given locale (not parent, no fallback) is ready. For example, if the language is “hi_IN” (Hindi-India), it – as of now – can get you the content for “hi” and/or fallback to “en_US” / “en”. Getting started with Yahoo! Mojito is pretty straightforward. The only catch is, you must issue a mojito start command. Recently I tried my hands with Nodester (www.nodester.com). Standard mojito code failed since server.js only instantiated an HTTP server but did not listen. 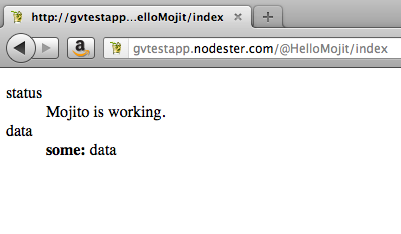 With inputs from Terry on making the server listen, I was able to run Mojito application on Nodester. Yahoo! Mojito is, now, watched officially by 1027 developers (as of writing this article) on Github (see https://github.com/yahoo/mojito/watchers) and is actively contributed by developers across the board (see https://github.com/yahoo/mojito/network). And I’m pretty sure, there will be several others who would have downloaded, installed and tried. Before getting into this detailed Hell World tutorial, I assume that you’ve already installed Yahoo! Mojito using the instructions given at https://github.com/yahoo/mojito README. I preferred an npm-install to ensure that I get a stable version. The first step will be to create an application with defaults, no customization, and get it running. Next, we’ll make the application run at port 80 and ensure that the content is available at “/” rather than a strange but intuitive default path. 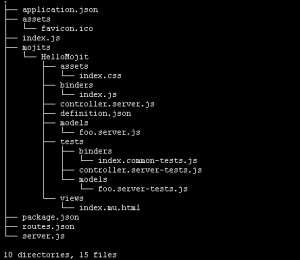 Mojito Application: An application based on Mojito framework. Mojit: A mojito widget – with its own model, view, controller and binder. 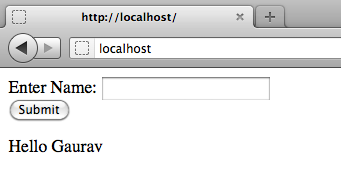 We call this application – “HelloWorldApp” and the mojit as “HelloMojit“. But the fact of the matter is PHP still has serious issues. And most recently, I can’t use it to run WordPress at Google App Engine, something that’s amazingly great for the starters who want to setup quick-and-not-so-dirty app. I thought… would it be good to have WordPress for GAE? 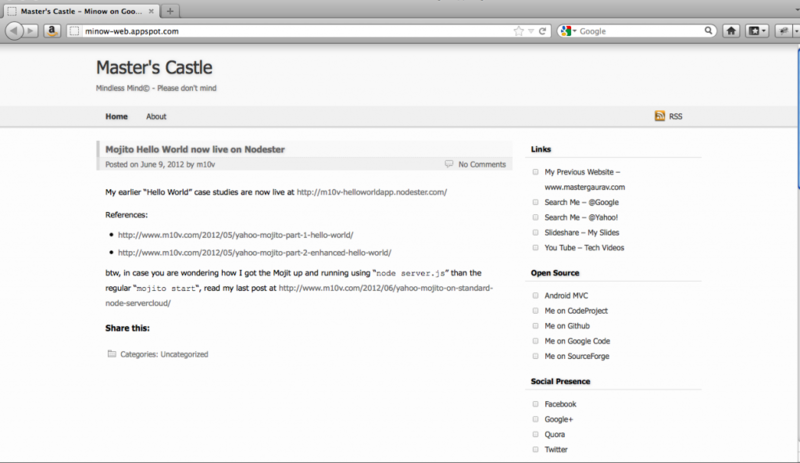 I came across Vosao – Open Source CMS for GAE/J. And I loved it immediately. Has a long way to go, and I do not see any active development on the same… surprised, what happened to the team. StackOverflow has a question – What CMS runs on Google App Engine, but I personally didn’t like any of them. And then I thought again… how about writing my own CMS with persistence in a Non-Relational Store with plug-in model so that I can run it on any store, be it GAE’s Data Store, MongoDB or Amazon DynamoDB or whatever. Let me see if I can hold on my thoughts and really get on with it… At the moment, no promises! Probably. Well, I feel it at least as of date. Can I just do a MyModel.getData(myCallbackFunction) and don’t worry if the piece of code is called on the server or the client? Can I just call a business operation doWork and don’t worry if it needs data which may have to be retrieved from the server or the client? Can I just call an operation doWork and don’t worry if it actually gets called on the client or the server? Well, that’s where – and for lot more reasons – Yahoo! Mojito framework comes into picture.